The InRow Chilled Water unit closely couples the cooling with the IT heat load. This prevents hot air recirculation, while improving cooling predictability and allowing for a pay as you grow environment. Available with and without humidity control, these products are intended to meet the diverse requirements for medium to large data centers. Data center operators looking to improve efficiency or deploy high density servers will benefit from the modular design of the InRow Chilled Water products. The intelligent controls of the InRow Chilled Water products actively adjust fan speed and chilled water flow to match the IT heat load to maximize efficiency and address the dynamic demands of today's IT environments. Leading edge precision cooling solutions specifically designed to maintain temperature and humidity within extremely tight tolerances. Perfect for racked and non-racked IT loads, these products meet the diverse requirements of any data center environment. These intelligent units monitor the status of components and environmental parameter to ensure correct functionality during all modes of operation. When combined with hot or cold aisle containment solutions, the Uniflair LE products can further improve efficiency and achieve higher densities. The EcoAisle is an intelligent thermal containment solution designed to increase cooling system efficiency while protecting critical IT equipment and personnel. The Active Flow Control (AFC) availble in the EcoAisle provides the intelligence to communicate to the cooling system in order to right size the cooling airflow to match the load of the IT equipment providing a reduction in fan energy over conventional cooling systems. The Eco Aisle system adapts to varying rack heights, aisle widths, and rack depths to support either hot or cold aisle containment. 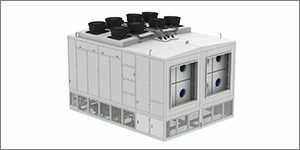 The Air Return System of the EcoAisle provides a centralized hot air return path for room based CRAC/CRAH units or external air handling systems. The optional UL723s listed Fire Safe System uses temperature sensors to drop ceiling panels in the event of a fire. The Fire Safe System can also be used in conjunction with a field supplied smoke detector to activate in the event smoke is detected with the aisle. EcoAisle provides a safe and efficient environment for IT equipment and personnell incorporating additional features for high efficiency LED lighting with motion detection. EcoAisle can be deployed in zones or modules to gain the benefit at either the rack or row level.